Lovely Ocean Front 2 bedroom 3 bath is being nicely renovated. Owner has already replaced all of the furnishings, all the floors are new, the only rooms left are one of 3 bathrooms and the kitchen. New pics on the way! 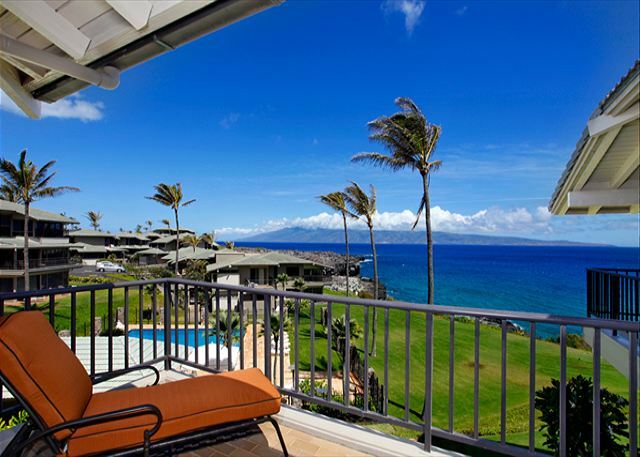 Endless views of the coast and nearby Islands of Molokai and Lanai from every room. Dreaming of Paradise? You'll pinch yourself when you walk into this gorgeous Bay Villa. It's everything you imagined and more, including discounts on tee times at the world-famous Plantation and Bay Courses. Stunning is an understatement! Magnificent painted skies at dusk and dawn and endless ocean views will take your breath away! This lovely 1 bedroom 1.5 bath beach front beauty will take your breath away! Perched just above the while sand beach of Oneloa Bay, this little jewel offers expansive ocean views from every room! If you have ever dreamed of vacationing on a beach in Maui, while enjoying an amazingly beautiful villa, then you have found paradise. Want to see some whales jump, or surfers riding the waves of Oneloa Bay? It’s all here and waiting for you..
2019 $500K Renovation! Too beautiful to describe. New pics to come! You'll be captivated by the panoramic ocean views from every room. 2 spacious masters, each with private lanai, Situated just above the crashing waves below!!! Fresh new upgrades with designer's touch throughout! Breathtaking sunset views over the neighboring island of Molokai!